In news that should provoke squeals of delight from fans of all ages and roles within the IT department, Hasbro has announced a My Little Pony movie for 2017. According to Variety, the animated film is being written by Joe Ballarini, who worked on Ice Age: Continental Drift and Turbo, and who will put his experience with talking animals and epochal events in the history of our Earth’s evolution to work on the franchise, which involves magical horses and the grown men who ardently defend their rights to love them. In a way, it’s surprising that it’s taken this long for a My Little Pony movie to be announced, given the franchise’s renewed popularity. 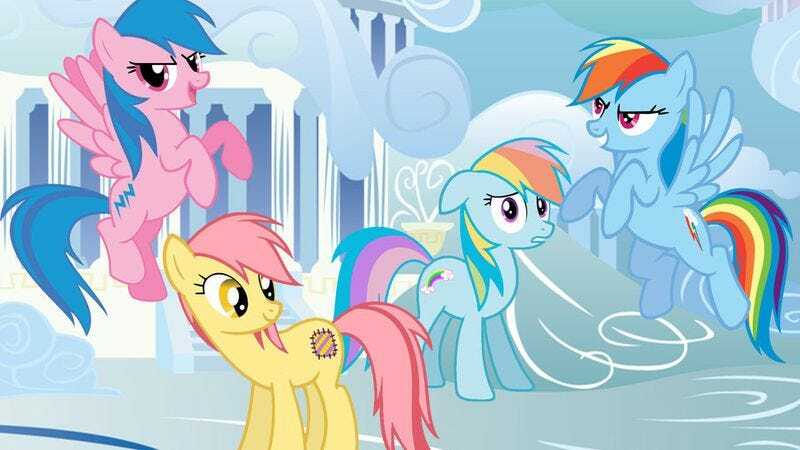 My Little Pony: Friendship Is Magic continues to foster a strong following on TV and certain subsections of DeviantArt that you would be wise to avoid, while the recent movies My Little Pony: Equestria Girls and Equestria Girls: Rainbow Rocks both enjoyed limited theatrical runs. This new My Little Pony movie will be the franchise’s first wide release since 1986’s My Little Pony: The Movie opened to a weak box office with the voice talents of Danny DeVito, Rhea Perlman, Tony Randall, Cloris Leachman, and Madeline Kahn, and the shortsighted belief that it would only appeal to little girls. But, as numerous probably behatted gentlemen will tell you in tweets, comments, and unnervingly long emails that I will receive today, that’s an unfair stereotype. Good day, sir.